Blackstone Federal highlights inclusiveness, security and creativity as essential themes for the future of DevOps. “We can’t thank Blackstone Federal enough for sharing their expertise with the local DevOps community," Holly Bazemore, DevOpsDays DC Organizer. The third-annual DevOpsDays DC was a huge success, thanks in large part to a strong lineup of informative presentations and group discussions, including three dynamic presentations given by Blackstone Federal team members. Hundreds of DevOps professionals, enthusiasts and newcomers joined in the two-day DevOps extravaganza hosted by Capital One at its Tysons Corner headquarters in mid-July. This year’s event was supported by over 30 sponsors from across the country, including media sponsor Blackstone Federal. 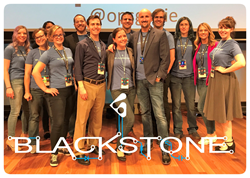 Blackstone Federal’s communications team provided photography and video coverage of DevOpsDays DC presentations. Blackstone Federal team members and improvisational theater veterans Melanie Harker and Sean Ellis woke up the room with their morning presentation “Change the Script: Deploy Improv, Not DevOps”. Harker and Ellis emphasized the importance of thinking outside the box in DevOps work by having attendees build “dramatographs”—physical interpretations of data sets. Blackstone Federal mobile security experts Anthony Glynn and Anne Dalton drove home the importance of securing smartphones and mobile apps with their exciting talk “Securing the Death Star in Your Pocket”. And transformation specialist Khadijah Anderson got the DevOps community thinking a little more inclusively with her poignant take on “Diversity and Inclusion in Technology”. For more information about how Blackstone Federal can help transform your organization, or if you consider yourself a top engineer, please connect with us at level_up(at)blackstonefederal.com.